Yu’la is by far the most straightforward of any of the 4 Celestial bosses. No heals, not a ton of out of control burst. Her 3 abilities are the Dragon nuke Jade Breath, the shield ability Emerald Presence, and the avoidance ability with a nuke back end, Liftoff. This post will discuss your options and the degrees of success I had with each, with the ‘most recommended’ pets toward the top. There’s also a video at the bottom if you’d like to watch the fight. In general, just hit her and use avoids if you have them, especially on the turns when you’d get hit by the Liftoff nuke. A good rule of thumb for all the Celestials is to avoid your huge one-shot attacks because of the boss buff, and to stun and avoid whenever possible. 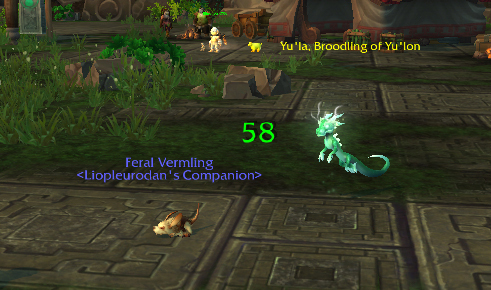 It seems as though Yu’la has been tuned specifically to be slower than the Hopling or Feral Vermling pets. She has 287 speed to their 289, so the Hopling is juuuust quick enough for Backflip to stun. I don’t bother with the second slot ability at all. I just use the humanoid Crush in the first slot and Backflip whenever it’s up. The Anubisath Idol is really nice here, but don’t try to use sandstorm! The Sandstorm block plus Yu’la’s Emerald Presence means that just about anything you try will hit for double digits, if at all. 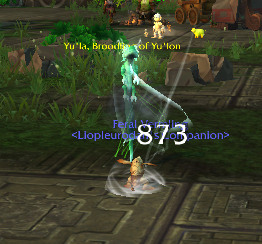 He’s excellent for starting off the fight, as an anchor, everywhere. I’d definitely recommend you get on leveling one of these ASAP if you don’t have one already. It’s super, super useful in several of these fights. As such, though, I might use the Idol on an earlier fight, depending on your stable. Regardless, this is a bigtime recommend, as the Idol can also make several earlier fights, like Aki, trivial as well. If you have a Flayer Youngling with one of its stats in Speed (H/S, for instance), you can combine the utility of both the Anubisath and the Hopling. You can use that Backflip stun when it’s on cooldown, use Deflect against Liftoff, and Blitz her face in the middle. This pet can also be really nice for PVP and starts off relatively high level, so you may want to put this one up for consideration. Peddlefeet starts off as Uncommon, and is an alright choice. He has a stun and a charged nuke. Ordinarily this would make him a first-line choice, but because of the Boss buff you’ll have some of your big nuke deflected, and you’ll have to time it well to get it past Lift Off. The stun is still fairly helpful, and Peddlefeet is tradeable so if you’re trying to slap together a team last minute you can try and get him off the AH. 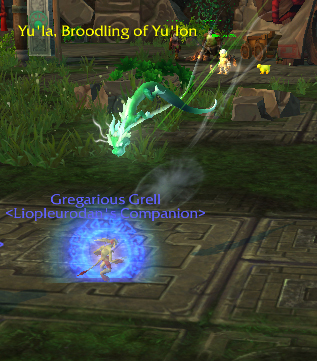 Speaking of the AH, a Gregarious Grell is an excellent choice here, if you can find one. 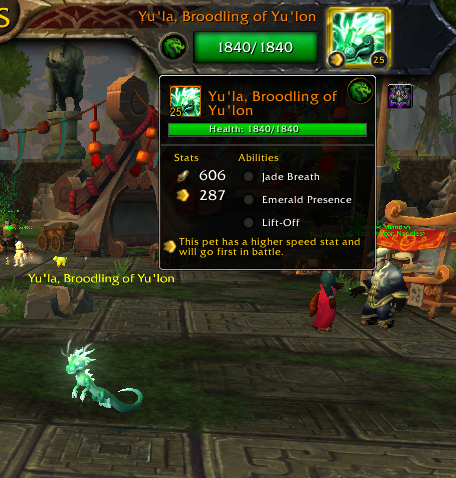 It’s a TCG pet, which I try to avoid in general, but I was able to nab one off my friendly neighborhood auction house for around 6 thousand gold so it’s not too awful. They start off rare, so you don’t have to worry about a stone, either. He has an avoid and a heal in addition to a humanoid Punch. I liked using him as an anchor, just in case I get down to the wire. Another stunner and all-around good choice is the Qiraji Guardling. You can cast Hawk Eye for some extra damage too. I’m not sure why, but I was less successful with her than the Vermling, which doesn’t make a ton of sense. Maybe it was just bad RNG strings on the 80% to hit Crush, or maybe it was the wrong breed for the job (an issue you won’t have with the Vermling. I had some decent luck with the Kun-Lai Runt. No avoidance and cooldowns means you’re probably only going to get one slow -> stun -> big hit combo off, so after the first one I’d just hit her with Takedown until your pet dies. This is a decent choice for an early pet, but I wouldn’t use it as an anchor. The Harbinger of Flame makes for an alright anchor, because it has the single-pet breaker Impale. Though, because it’s a beast ability, it usually does just a bit more than its regular humanoid Jab ability. The Curious Oracle Hatchling has the same Backflip move as the Hopling, so it looks like it might be an alright choice, but it’s slower than Yu’la and starts off as Uncommon to boot, so I don’t recommend it. Beyond that, your choices are fairly ho-hum. 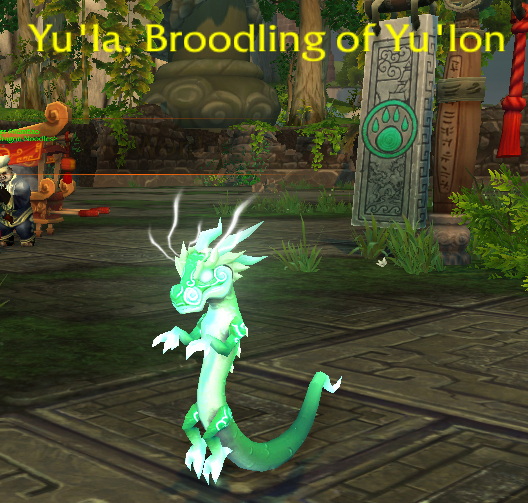 Because of Yu’la’s Emerald Presence you’re not going to get too far with non-humanoid offense. As a result, I didn’t have a ton of success using off-family to defend against her damage. 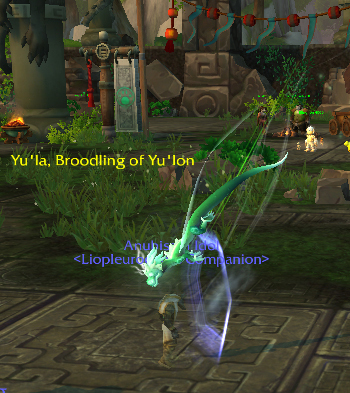 Also, she has mixed damage abilities (a Flying and a Dragon), so that was kind of right up to begin with. Here’s a video of the Anubisath Idol, Feral Vermling and Harbinger of Flame against Yu’la, to give a better idea of what you’re up against. Like I told him, I’m exploring the use of the Raven with Xufu, but it’s a pretty slick trick if you have an extra raven kicking around and few humanoids. This entry was posted in strategy, video and tagged 5.4, celestial tournament on August 20, 2013 by Liopleurodon. Clock’em can solo Yu’la with his dodge and jab. yeah, there are a lot of pets that can, or almost can. The Grell is probably my favorite.